Wildcrafting: What does a wild (and mostly local) dinner look and taste like? 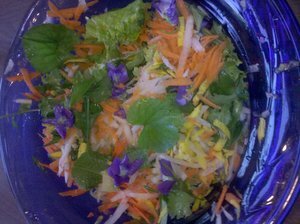 Posted on Wed, May 5, 2010 : 8:49 a.m.
A mostly wild salad made colorful with violet leaves, as well as grated carrot, daikon and golden beet. The menu was based on what we could harvest, and what my foraging friend had found the day before. Some times of the year there is an abundance of wild free food to feast on. Tonight was one of those nights. It started with fiddleheads, Matteucia strutbiopteris. He had some to share, and I enjoy them in the spring. They are fun and interesting and strange, but truthfully it does not have a lot of flavor and isn't a food I go too much out of my way for. I suggested we add my spring favorite, wild pesto. 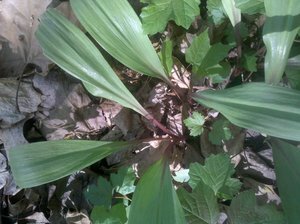 But I had no wild ramps, Allium tricoccum , which make a wonderful dish divine. So off we went to harvest ramps. Within 45 minutes we each had a full bag, with a hillside full still left to grow and flourish. I know they do well, since this area is picked over each year and they keep spreading. They were popping out of the ground with almost no effort and no need to dig. Some of them were almost laying openly on the ground once the old leaves were scraped away. I just had to tug a bit to remove them from the soil. 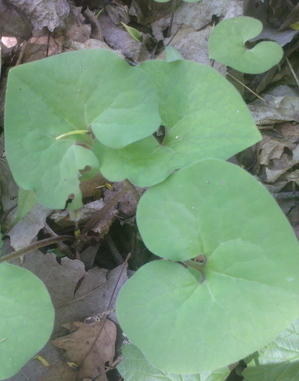 We hiked out of the woods, but not before admiring some wild ginger, Asarum canadense; wood nettles, Laportea canadensis; and trout lilies, Erythronium americanum (all foraging targets at other times). The trillium Trillium grandiflorum were blooming, and unfortunately so was the dame’s rocket, Hesperis matronalis. Dame's Rocket is another invasive. Don’t touch the trillium, but the dame’s rocket is OK to destroy. 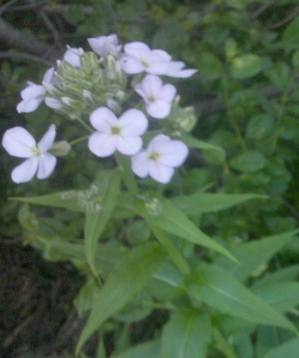 The flowers of dame’s rocket are tasty and great in salads. Garlic mustard Alliaria officinalis was prevalent and in full bloom at the beginning of the trail, luckily not in this woods. Yet. Another flower great in salad. Please harvest as much garlic mustard as you can, saving the leaves to eat and pulling out the root to destroy the plant. Wild native ginger's roots are used for tea and medicine. There was yellow dock Rumex crispus also along the trail, with poor man’s pepper Lepidium virginicum and glorious flowering yellow mustard (one of the Brassicas). Dame's rocket is another invasive that's just starting to bloom. The flowers are tasty. It's often confused with phlox. 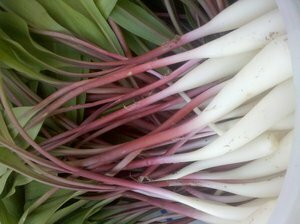 At my foraging friend’s home, we cleaned ramps together, a task much more pleasant with company. The whole plant is used, from the bulb that is the root to the soft green leaves. Those ramps were combined in the food processor with yellow dock leaves found nearby, some black walnuts he had bought, olive oil, and salt. Served over Al Dente pasta (a local variety) with a bit of grated cheese, it was heavenly with a lot of garlicky bite from the ramps. We steamed some asparagus Asparagus officinalis and fiddleheads Matteucia strutbiopterishe he had collected over the weekend, and they were a great side accompaniment to the pesto. The other dish to grace the table was a mostly wild salad. The wild part was dandelion greens Taraxacum from the yard, more yellow dock leaves, some violet Viola leaves and flowers. With a bit of lettuce, I also had a carrot, some daikon radish, and a raw golden beet that I grated. It was a beautiful sight. The tastes were a combination of sweet carrot with bitter dandelion, chalky almost meaty yellow dock with the delicate lettuce, a slight bite from the daikon and the earthiness of the raw beet. The violets had just the slightest sweetness, but mostly just looked great. I like to describe these sorts of salads as a riot of flavor and colors. Simple time spent outdoors and with a friend, joined by his appreciative son for the eating part, and the enjoyment of food that was mostly free, made from basic ingredients, and nearly all local. That’s what a wild food feast can be. Please note: Use additional resources to positively identify wild plants before eating them. For example, there are similar looking fiddleheads that can make you sick, the Osmunda cinnamomea. Spring is also the season for putting poisons on our lawns. There is some danger from wild plants being sprayed with toxic chemicals. With the exception of the ferns, the plants included here are easy to identify and they don’t have toxic look-alikes in Michigan. Linda Diane Feldt is a Holistic Health Practitioner, Herbalist, writer and teacher. You can reach her at ldfeldt(at)holisticwisdom.org follow her on twitter or visit her website.